Two lowly Japanese farmers repetitively climbing an intense incline slope from the seaside shore to the top of a mountain to water their measly crops is the signature image of Kaneto Shindô’s social realist experimental film. Shindô observes his characters' backbreaking work with the same kind of salt of the earth honour as in the Soviet propaganda films if the 1920’s. Shindô’s cinematic eye triumphs over his self-imposed dialogue-free obstruction to achieve a woefully tragic slice of Japanese peasant life. 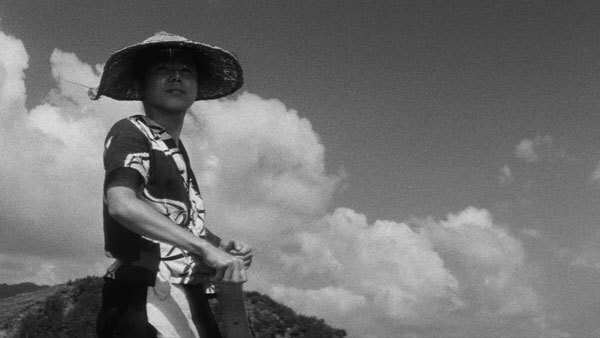 Dramatic aerial camerawork in the opening shots establish the geography of the tiny island inhabited by the family of four who serve as Shindo’s subjects of labour-torture. For fans of Mikhail Kalatozov we can’t help but compare the openings of ‘Naked Island’ with ‘I Am Cuba’ or ‘The Letter Never Sent’. The melancholy, unheroic music brings us to the centerpiece sequence which introduces the laborious task of the mother and father of the family, who start the task at sea level collecting water in two wooden buckets, then strap said buckets to both ends of a long board, then perilously mount this board onto their backs to be brought up the side of the mountain with the pace of a snail. Shindo seems to channel the thrill of the editing techniques pioneered by the post-revolutionary Russian filmmakers by intercutting the journey of these buckets of water with the watering process – crops planted in desert like soil with very little chance of surviving. Shindo plays out this sad yet beautiful pantomime of labour well past its natural running time to achieve the same kind of hypnotic repetitiveness as their Sisyphean tasks. Why such dedication to such menial and backbreaking labour? Why not? Without overt proselytization of the Soviet propaganda films Shindo subtly and hypnotically ingrains his postwar socialist themes of the primitive Japanese lifestyle into our minds. Some compare the depiction of the crude, uninspired existence to the urbane Japanese life depicted by the more renowned works of Ozu at the time. There is no time for reflection or enjoyment of life here – a theme exemplified by the mealtime scenes wherein we see the kids and parents eating in haste their measly noodle bowls as quick as possible so they may go back to their fruitless labour. Shindo eventually explores other aspects of the family’s lives. Occasional title cards tell of changes in season, though we barely see a progression in the family lifestyle or wealth. Trips to the market to sell their wares further the pitiful tragedy of their lives. A single fish caught by the perky younger child is sold by the mom for a few dollars. While the film is a consciously austere affair, there’s a strong feeling of impending doom, which fuels the palpable tension which carries through the picture. Shindo punctuates the hill climbing sequence with a fallen barrel which spills the mother’s precious water. This results in a brutal outburst from the father who slaps his wife with impudence. It’s a shocking and unexpected moment of emotion which stays with us the entire film. The next moment of emotional expression comes at the end, a strangely manipulative sequence which doesn’t quite fit the aesthetic philosophy of narrative minimalist before it. But an accident which threatens the life of the older child creates a sense of urgency which satisfactorily pushes the film to an powerful, though tragic conclusion. Shindo’s stunning black and white anamorphic cinematography is poetically beautiful and starkly contrasts the grim tragedy never leaves the lives of Shindo’s sad subjects.